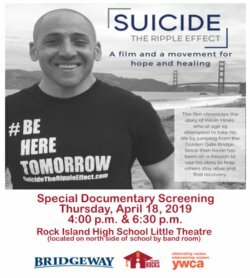 In partnership with Bridgeway, Rock Island High School is hosting a screening of an important documentary Suicide The Ripple Effect on Thursday, April 18. Two screenings will be held - one at 4:00 p.m. and one at 6:30 p.m. The screenings are free and open to the public. Following the film, staff from the Robert Young Center, Transitions and NAMI (National Alliance for the Mentally Ill) will be on site to answer questions and offer resources. The film chronicles the story of Kevin Hines, who at age 19 attempted to take his life by jumping from the Golden Gate Bridge. Since then Kevin has been on a mission to use his story to help others find recovery and stay alive, and has become the worlds most prominent suicide prevention speaker and advocate. The film also features some of the world’s leading suicide prevention experts and shines light on people who are using personal experiences with suicide to help others find the hope they need to stay alive.